It has long been promised that the PC will become the entertainment hub of the home. However, the problem with this vision is that our computers tend to sit in the bedroom and means getting those movies, music and pictures the last few metres to the living room is a real pain. This year's CES - the world's largest consumer gadget show - boasts a wealth of new kit which aims to make it easier to access digital media around the home - and in particular on TV screens. Ideas on what should be at the centre of it all vary, from PC-based media centres, digital video recorders or even video game consoles. Microsoft is promoting its Xbox 360 as the place to store and access movies and songs. "Xbox 360 is at its heart, the world's best games console and we're continuing to sell it very well. 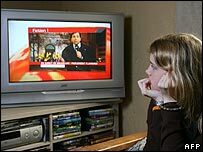 But we also know that people have it connected to their TV, and that means they want to see movies," said Robert Bach of Microsoft. "So we've added a Download Movie service, we've added an HD DVD movie player to it. You want to play music, so you can take your MP3 player or Zune player, and plug it in and see your music. "Here we're announcing that you can take IPTV digital TV services and run them on top of an Xbox 360." It should be pointed out that the downloads are only available to those that have a hard drive for their Xbox 360. Sony's PS3 console does something similar. Microsoft's ambitions also include its Media Centre software which has not made the impact some had hoped for. It will now get a boost by being integrated into all but the most basic versions of Microsoft's new PC operating system - Vista. The consumer versions of Vista is scheduled for launch on 30 January. Apple is getting in on the act too. 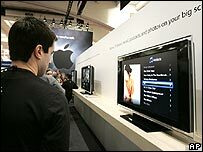 At the MacWorld show Apple boss Steve Jobs gave more details of Apple TV - the set-top box which uses iTunes to stream media to a television. Various launches at CES suggest that moving files around the house should be easy. We have more choices now than ever before - hardwire Ethernet cables, Bluetooth or wi-fi. Netgear's new Digital Entertainer set-top box is one of several here that let you stream HD pictures from your PC over wi-fi to the TV. But obstructions and interference may hamper a steady picture. Presuming we can move our digital media files around without too much problem, you then have to consider the alphabet soup which is compression formatting - or codecs - which allow all your devices to understand each other, otherwise you will not see a thing. I think it's unbelievably frustrating because you purchase the music expecting to be able to play it where you would like to play it and then you find out later that this is not quite the case. "Many of the files that people would like to buy and download, including movies and TV shows, are actually protected with what's called DRM, that is Digital Rights Management software," said Josh Bernoff an analyst from Forrester Research. "A lot of this software is incompatible with some of these devices. "So for example, if you buy a movie or TV show from iTunes it'll work fine on your iPod but it's unlikely to work on, say, your Xbox 360 that happens to be connected to the same setup." Slowly this is changing. For instance, last month if you had bought a rights-protected Windows music file it would not have played on Sonos' high-end multi-room streaming system. After a year of negotiations Sonos' hardware can now support those files. Now the boss of Sonos wants Apple to also open up, claiming it is customers who lose out. "I think it's unbelievably frustrating because you purchase the music expecting to be able to play it where you would like to play it and then you find out later that this is not quite the case," said John MacFarlane of Sonos. "That's not, generally, well explained at the point of purchase." The steady march of technology is also helping break down these barriers. For instance, a new PC to TV chip by start-up Quartics might help audio and video streaming compatibility. It allows any files your laptop can read to be streamed over wi-fi to your TV or digital projector. It is hoped the chip - which can be updated with any new video formats as they emerge - will be integrated into some TVs by the end of the year. And the new faster 802.11n standard for wi-fi should soon be ratified, which will help boost consumers' confidence in streaming video. But for now it might be best to take all the hype with a pinch of salt.